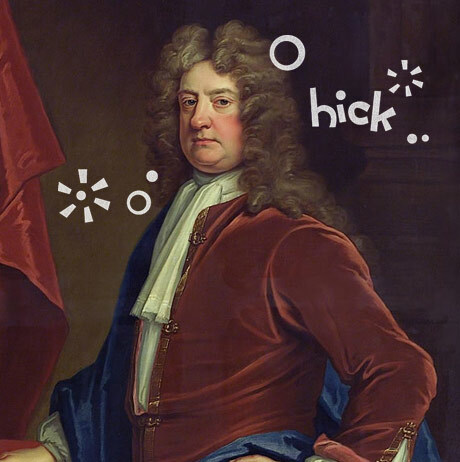 Idoth my cap to this guy, this is one of the best pissup stories I’ve ever heard – Edward Russell (1653–1727) was the First Lord of the Admiralty and decided to throw a party for his fellow officers in 1694. Presumably wanting to put on a bit of a show, he filled up his garden’s fountain with 250 gallons of brandy, 125 gallons of Malaga wine, 1,400 pounds of sugar, 2,500 lemons, 20 gallons of lime juice, and 5 pounds of nutmeg, thus setting the world record for history’s largest ever cocktail. Apparently bartenders actually paddled around in a small wooden canoes, filling up guests cups. The party continued nonstop until they drank the fountain dry, took them a full week, pausing only briefly during rainstorms to erect a silk canopy over the punch to keep it from getting watered down. Apr 15	This entry was posted in Drinking, Funny by cookie. Bookmark the permalink.